What got you started on the Kyoto Machiya Restaurant Guide project—the impetus that really got you going? When was that? About 10 years or so ago, Marc Keane, who is the founder and chairman of Kyoto Mitate International, an organization to encourage the preservation of traditional architecture and the Kyoto landscape, asked me to replace him as chairman for one year while he went to teach at Cornell University. 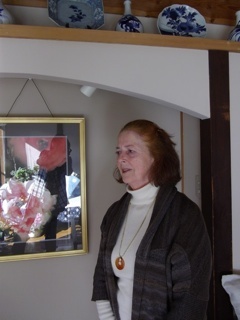 I hesitated because I am a real neophyte compared to Keane, the author of a number of excellent articles and books on gardening including The Japanese Tea Garden, Japanese Garden Design, Sakuteiki and Songs in the Garden, in addition to his work supporting the renovation of traditional structures. Knowing little about the situation concerning the dire loss of townhouses in the city, that post offered me the chance to learn about what was being done in other cities. I organized groups that visited renovated sections of Omi-hachiman in Shiga prefecture and met with their volunteer restoration people. We were also guided by local citizens interested in the preservation of the beautiful district of Imai-chō in Nara. That was an exciting year for me to see what real efforts were being undertaken to preserve and appreciate old structures. It was also about that time that Leaf Magazine started a series called “Machiya Gohan,” introducing old Kyoto machiya that were being converted into attractive restaurants. I absolutely drooled over the photos and tempting food descriptions and decided to start visiting their listings. Please explain the steps leading up to acceptance of the project at SBP. While visiting Stone Bridge Press in Berkeley around 2007, I wistfully mentioned that the next book I wanted to write would be a restaurant guide to renovated townhouses. Owner and editor Peter Goodman, said: “Sounds good!” which I took to be encouragement, and so I started to carry a notebook and camera with me when I went to eat at one of these restaurants and cafes. Around that same time, there was a story in the newspaper about a professor in a university in Hokkaido who noticed that there weren’t any maps or good information about Sapporo for English speakers, and so he wrote a small newsletter/book and contacted booksellers to handle it throughout the city from October 2012; 15,000 copies were sold. Wow! I thought, now we were talking about a possible financial gain besides getting information out to the public. I decided I could do as much in Kyoto. Photograph courtesy of Ben Simmons. In the end, I spent about ¥1,500,000 just in eating and getting myself to these restaurants. The investment was huge and I found no one and no organization was going to come and ask me to do it. The Kyoto Tourism Office in City Hall is mainly designed to help Japanese tourists, and the civil servants there are not able to set up programs for the large number of non-Japanese visitors to the city, something soon obvious to non-Japanese visiting Kyoto. When I went to inquire about possible help in preparing or funding publication of this book I realized how impossible it is for the city to do anything of the sort. There is no mechanism to encourage tourism or communicate information about the city for non-Japanese. The people in charge of tourism in Kyoto are regular civil servants and are transferred to new posts every three years; they are often new to Kyoto itself and know little about either the city or the tourist industry. Thanks to an influential friend and advisor, I was recently given the honor of “Visit Kyoto Ambassador” for the work I have done in publicizing the city, but all I received from the city were some name cards and a lovely bowl of green tea. I have never been consulted about the tourist trade. You had various adventures in the preparation of the book. Could you explain about some of them? Were the proprietors of the restaurants always cooperative? Did you interview them at length? Did you find some that you could not use? Adventures: Well, most of them were culinary ones I guess. I never told the proprietors that I was writing a book because there are thousands of people writing books at this very moment and that makes little impression on most people. Usually, when requested to write a book, the publisher will call the place to be visited and pre-arrange a meeting. This is not what Stone Bridge could or would do. I simply went, ate there, and talked to the owner/cook/staff and asked about the structure of the building and about the restaurant’s name and cuisine choices. I teach Kyoto History and Culture to a group of very interesting adults in the Kyoto NHK Cultural Center and invited them to join me before our Tuesday class. At first only one or two of them came, but now between 8 to 10 people show up weekly and help assess the fare and fee. It has turned into quite a jolly gathering of epicures, continuing still, and they seem equally excited to be introduced to lots of places they might not otherwise venture into. Toward the end of four years, I asked my dining companions to make a list of the top 10 places they liked and discovered such diverse opinions that eventually I had to write the names of the top 20 as a beginner list for first-time visitors. I discovered that men were more concerned with volume and the cost of drinks, and women with the taste and presentation—this maybe a no-brainer, but it skewed the results more than I had anticipated. Then I put my thumb on the scale you might say by adding places that were not open on Tuesdays or had not been visited by my pupils but were favorites of mine. Also, I declined, for the most part, to list places that required one to sit on tatami while eating unless there were hori-gotatsu into which I could comfortably settle my legs. A further adventure was that then there was the problem of restaurants going out of business, either because they couldn’t pay back their loans, the owner retired, or any number of shifty reasons I don’t even want to think about (like money laundering or yakuza payoffs). Others did not attract me by being too grimy or serving poor food, or there was too much cigarette smoke in a confined setting. I think I eliminated about 30 places on such counts. Actually, after the deadline last May, two restaurants are in the book that subsequently went under, something very likely in this kind of business. I am reminded of such an incident when I met a Frenchman in front of his restaurant one sweltering day in August; when I mentioned that the book listing his restaurant would be out in September, he said: “Merde! …” and I thought that a strange response to my news, but assumed he was expressing his astonishment that the book had taken so long to get to market. Later I found out that he couldn’t meet his loans, and sadly had decided to close the end of that month—the true reason for his exclamation. When it came to the editing process, what were some of the hurdles you had to cross then? What sorts of problems did you anticipate or just came up once the editing began? Hurdles—my knees are weak from jumping them all. When I proposed to do this book after Exploring Kyoto was on the market, I knew that once again I would have to assemble all the material myself. This meant a monetary outlay—getting there, paying for the meals—and lots of logistics: keeping track of over 200 restaurants, taking photos of the places and meals and putting down my initial impressions after returning home and later tweaking the entry until it became presentable text—the usual. The nature of a restaurant guidebook is that it has a comparatively short shelf life so I was in frequent communication with my publisher about getting the project finished. I wanted it to introduce machiya, their history, current usage, and cultural value rather than do just a book about food. There are plenty of blogs and info out there to satisfy a gourmet’s curiosity but nothing on a restaurant’s structure and atmosphere. I usually ride a bicycle around this bicycle-friendly city, gathering flyers and name cards from places I go past, checking them against existing info to confirm their workdays and prices. Places disappeared, reappeared, had new owners, new cuisine, were renovated again or turned into sweet shops that did not serve lunch, and thus were eliminated. Almost five years into working on this book, it seemed ready for publication. Peter Goodman assigned a new young editor named Jeanne Platt to start working on the text. She was quite excited to learn more about Japan and starting working fulltime on the text. Loads of questions and answers flew between us: she in California and I in Kyoto, explaining what a hori-gotatsu was when my description was not clear enough for her. She doubled as one of my readers (I always have several people read for me), which proved invaluable. Those of us who live here are so accustomed to terms like tatami, we never question them, so it was wonderful to work with her, forcing me to really explain myself. One Friday (my Saturday), she mentioned that she would go to work on Sunday (my Monday), to continue the intense editing that had begun. Release date was to be October 2011. Monday came and went without a word and on Tuesday I got a shocking mail from Peter Goodman saying that the young woman had died! It turned out that she had had diabetes, but had been managing it through her diet; what went wrong we do not know, but we were all stunned. The loss of this lovely, vivacious, capable 30-year-old woman just paralyzed us. The book entered limbo. Edited text between us had disappeared into the ether, editing had to be redone, and even today some pages, such as the machiya floor plan, are missing. Perhaps this page is this page is still making its lazy rounds in cyberspace. Today, editing text and layout takes place in bits and pieces with items constantly moving between editor and writer, and one does not get a sense of the finished product until… well, it is finished and in one’s hands. Having to simply assume that all inclusions have been noted is probably one of the most frustrating situations when putting out a book today. Eventually, Peter Goodman found a new editor and got involved in the editing himself, and things got redone, found, redone again. In the meantime, several more restaurants went out of business. John Goodman, the friend who had photographed the first group of storefronts, was no longer available to shoot new or missing restaurants, and although I was more than anxious to do them, the art director did not welcome my low-level skills with my ¥10,000 camera. Coincidentally, Allan Mandell, a landscape guide and professional photographer from Canada was here for two months with his wife. He had expected to conduct two back-to-back garden tours but with all the news on the first anniversary of the 2011 tsunami and the radiation scare on Canadian TV in March 2012, his May and June tours were cancelled. He, however, had already agreed to a house swap. I couldn’t have been more thrilled when he said he would gladly bicycle round photographing places with his professional-grade camera. Another hurdle overcome. The gods and goddesses came through for me again. 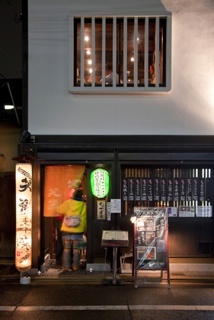 New photos of good quality were ready and a couple of new machiya restaurants added. The release date had been pushed back so many times, I almost wept when I finally beheld a finished copy in my hands. 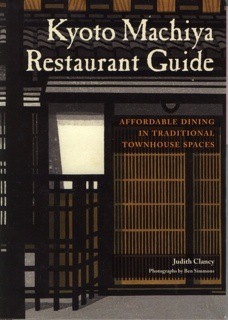 Kyoto Machiya Restaurant Guide: Affordable Dining in Traditional Townhouse Spaces: print edition at Amazon.jp. Also available for Kindle. Every book involves compromises and dreams unfulfilled. What were the big ones for the Machiya Restaurant Guide? Dreams unfilled—color photographs. Ben Simmons, the photographer, does fabulous work, and I wish the photo essay had been in color. 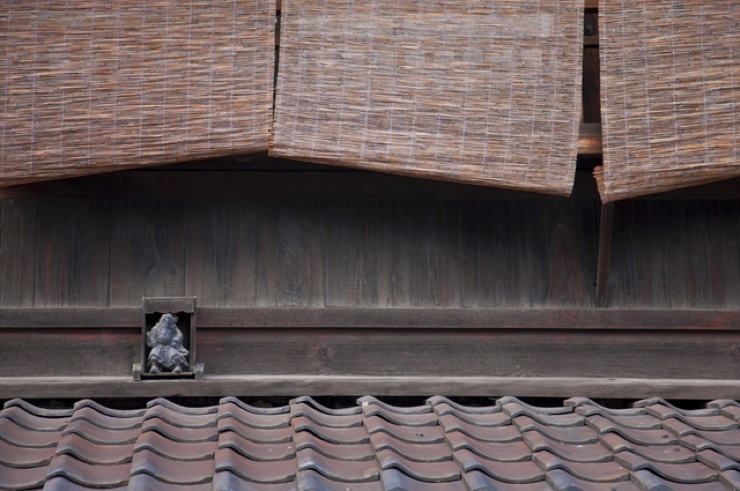 The subtle richness of Kyoto machiya facades, clay walls, the smooth surface of grained wood, and the sublime light of shoji paper that transforms the interior of these structures should to be seen in color. Japanese interiors are the most textural and understated in the world, so I wish this middle section had been in color as well as the individual restaurant fronts. Color is available in the Kindle edition, but I had hoped that it would also be in the paper format. Fortunately his colors have a chance to shine in Kyoto: City of Zen, one among many of his fine publications, which also came out in 2012. Were there some ground rules you decided on in creating the book—things related to getting around in Kyoto, Kyoto culture, etc.? I did not want this book to be about food—a topic requiring much more work than necessary to enjoy a meal out!—but lots of food had to be explained, especially kyō-yasai, the vegetables that have ruled Kyoto tables for centuries and are well recognized by Kansai people. Then there was the description of restaurants and how food and preparation utensils and equipment are viewed so that readers would know, for example, to only expect noodles and no fish at a noodle restaurant. This can often stymie the foreign couple when they want to have kaiseki, fine traditional cuisine, and beefsteak in the same setting. In addition I mention cultural gestures such as lifting your soup or rice bowl when you eat, removing shoes, and walking around zabuton cushions instead of on them. I also asked the restaurant proprietors about the names of their establishments. Some of them are connected to their locale, introducing historical tidbits for the casual reader, or reflective of the owner’s taste. 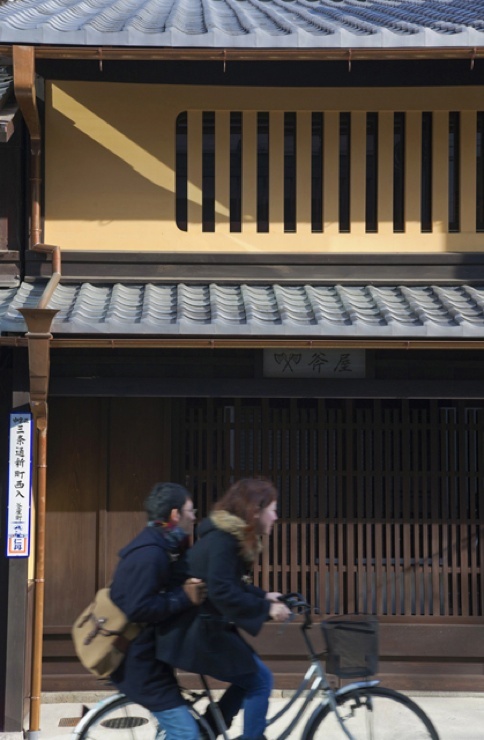 I hope readers can learn a bit about Kyoto beyond what is on the menu from this guide. 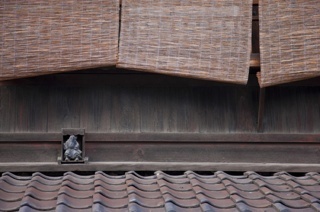 As with my guidebook, Exploring Kyoto, so little information is available to the visitor and so much is overlooked. Even the signs before temples and shrines leave much to the imagination and everything else in the city remains virtually unknown, even to Kyotoites! Passing interesting old buildings, be they former banks, companies or townhouses, most visitors have no way of knowing what purpose they served or how these structures enhanced the history of Kyoto. In the West, we are used to seeing some buildings with a historic marker identifying them. This is just beginning in Kyoto, a city of great repositories of Japanese personalities, events, customs, mythology, and folklore—a continuous education for the curious. One issue that the publisher and I struggled over a bit was directions and addresses. In Kyoto, rarely does one give directions by chō (district) or postal address. Local residents say something like “[it’s at] Sanjō, Kawaramachi, agaru, higashi iru,” which means “north of Sanjō Street on a street east of Kawaramachi Avenue.” Vague perhaps, but everyone understands this—taxi drivers and locals. However, many blog sites just list the chō (postal address), which leaves even a local without a clue. I don’t even know the chō that is two “chō” away from my house and I’ve lived in my neighborhood for eight years. The publisher thought it made sense to use the addresses given on the blogs or name cards of restaurants, and I wanted to use directions the way they are spoken in Kyoto. In the end, we have both, directional addresses in English and name-card address in Japanese (e.g., “North side of Nijo-dori, just east of Yanaginobanba-dori”), and the same is printed in Japanese for the taxi driver or local person who may be asked on the street. At any rate it was an interesting dilemma we struggled our way through. Another gratifying aspect of producing this book was the pleasure of delivering postcards announcing the book’s release to all the places included in the book. Most restaurants and cafés seat only 20–30 people and are run by a married couple or some friends. While the slightly nerve-racking prospect of having to deal with non-Japanese-speaking diners may have increased for the restaurateurs, they all seemed very pleased that some new business might possibly come their way—free advertising is always welcome, especially for small establishments. These people work hard, six days a week, getting up early to clean, receive deliveries of ingredients, and start preparations. It’s a tough life, not the fun one that many diners envision when they might meet an owner sharing a drink with patrons, relaxed and sure of a good day’s income. I will be glad if this book brings a few more diners their way. I continue to go to new places and already have ten more restaurants to add in the case there is a new edition, but presently, the back few pages are blank so users may add places they have discovered on their walks through the city streets. Hopefully, this will make visitors more adventurous in their eating selections and help all these restaurants survive and continue to delight adventuresome gourmets. I never seem to learn that simple books are never simple. This one developed over a period of several years, and rather than starting out as a fixed concept with determined assets it evolved according to need, time, and personnel. Books that do take on a life of their own are, to me, inherently more interesting—like an alien life form—but tend to make everyone crazy for a while. In the end, I must say that I’m really happy with how it came out in terms of content, format, design, and for lack of a better term, likability. Much of this is due to the author, Judith Clancy, for whom the word “indefatigable” was surely invented. Only after reading her discussion did I understand how much time and effort this cost her, and now I feel badly about sending her the endless stream of questions and follow-ups over the course of editorial and production work. It was so useful having her there, in Kyoto, to get updates and check facts. I can’t imagine how any travel book can get done these days, when everything needs to be as current as the next blog or website, without access to fresh—and accurate—information. For us doing books about Japan from San Francisco, that is an ongoing issue. Without the Internet we’d be toast, but of course we all know how unreliable the Internet can be. Long-gone restaurants still survive as Internet ghosts on dining and travel websites. Making sure the facts are right was only one of many challenges facing this book. We agreed with Judith that we didn’t want just a list of restaurants but instead wanted to use the restaurants as a way of giving visitors a taste of Kyoto culture as well. So from the outset the book was going to be part cultural essay and part restaurant guide. Judith sent us all the front matter as if they were separate chapters, but with the many sections of the book—at some point we decided to include a photo essay, since the beauty of machiya is poorly described in words—we decided it would be best to pull all the chapters into a single cultural section at the beginning, which involved some rewriting to make all the pieces fit. When we first got the manuscript, all the restaurants were in alphabetical order. That’s also the order in which they were initially edited. And for a while we thought that is how they would appear in the book as well. But we had a lot of discussion at the office and with Judith about what a better organization might be. We considered organizing by cuisine, or keeping it just by name, but in the end decided that, if we were going to have maps, the book needed to focus on geography, and from that we began to discuss exactly how the book was going to be used. Our assumption was that visitors would be in a part of the city and would want to know where they could eat nearby. Organizing by district made that simple, and also led to our decision to put the maps in the book at the head of each chapter instead of a separate map section, which had been part of an earlier plan. But the decision to organize by district forced us into the work of creating two additional indexes, one by name and one by cuisine. 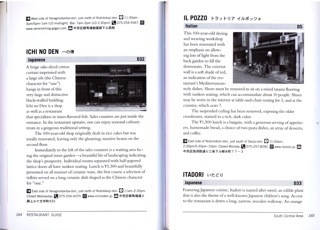 Thus, we felt a visitor could find any restaurant in the book. While it seems an obvious choice now, we spent a lot of time discussing this among ourselves, and I even went so far as to re-order the restaurants in different ways at different times. And because the book was for tourists, we decided we had to have a glossary and to keep Japanese word usage in the text to a minimum (and with no macrons, thank god!). Judith’s restaurant descriptions had been written at different times and originally were more discursive. For the sake of consistency and ease of use, we decided that all the descriptions would get rewritten: not so much that the text would be changed but that each entry had to introduce its content in much the same order: exterior description/history/background, description of interior/seating/architecture, food offerings/menu/price, ending with a block of data (for which we had to secure all the addresses in Japanese to show to taxi drivers!). All of this rewriting and repositioning made the Word redlining files a real nightmare to sort through. And our system and Judith’s system seemed to have certain incompatibilities that sometimes made our files mutually unreadable. Things got understandably and tragically complicated when our in-house editor, Jeanne Platt, passed away suddenly. I can’t say enough good things about Jeanne, for whom Judith’s book was her first big meaty project. She worked on it diligently, as indicated by her Word files. And as she was in the midst of editing and corresponding with Judith, it took me quite a while to figure out what had been looked at by both parties and what was still in process, untouched, or waiting for resolution, or had issues waiting to resolve. This made the project very special to us and to Judith, and in Jeanne’s memory we really did labor to make the book better and more complete. In the end, everything had to fall into place. All the descriptions had to be consistent and complete. It was a pain checking addresses and map placements on Google, and every time we found a restaurant incorrectly located we had to edit the Illustrator files that held the maps. Here and there we found that the maps we had received were misleading, so we then had to draw in new streets and intersections, a job that no publisher in his right mind ever wants to undertake. Thinking back, it seems that everything about this book took time and more time. We had to verify all the names in Japanese and then decide how they were going to be referred to in English. Sometimes a restaurant had an official “funny English” name, so should we use that or a translation? And whenever we changed our mind about what was right, we would have to fix both presentation order in the book and indexes. We found also that some restaurants were actually in the wrong districts according to our maps, so we would have to fix the map and redo the book’s layout, producing much-feared pagination changes, which in turn led to more indexing fixes. Well, that’s how these projects go, isn’t it? You start out with a simple idea, decide you want to do a good job, discover it’s not so simple, curse your fate, and then proudly hold the finished book in your hand. If only readers and book buyers understood the amount of work that goes into these projects! Our book costs $16.95, which is a great price but is not going to put it in the black unless we are able to sell many thousands of copies. Our expectation that the Japanese book market would improve and that tourism in Japan would bounce back has not been realized. It is frankly a terrific struggle to get the book onto bookshelves in Japan, particularly in the Kansai region. Shelf space in English-language bookstores has diminished, but I think the worst thing is that there are no longer any dedicated sales reps managing the foreign-language bookshelves. We’re doing what we can, but that mostly means dealing with the big chains. If the book is somehow also getting into hotel bookstores and other tourist-oriented spots, that would be great, but it’s nothing we’re able to do ourselves. Back when Yohan Distribution was on the scene, things were much different. People can of course get the book on Amazon.co.jp, but they don’t necessarily have it ready for quick shipment. And as long as Amazon is there I suspect a lot of Japanese booksellers figure they can’t compete anyway. At the same time the print edition came out we released Kyoto Machiya Restaurant Guide: Kindle version. A travel guide in e-book form is an obvious choice. Our best-selling e-book in fact is a guide to China. E-books are great for travelers: lightweight, easily searchable. We were able to include all the maps and images in our e-book, and in fact in the e-book we kept all the original images in color. I realize that authors want their books to be in color, but financially it's just impractical. But in an e-book, a color image costs as much, or as little, as a black and white. With close to 200 images total in our book, including Ben Simmons’s artful photographs and all the storefronts, it would’ve been a nightmare to essentially create 2 books and separately place color and black-and-white images in each. So what we hit upon was receiving all the images in color and then creating a duplicate folder, from which black and white images were created in Photoshop. The trick was to keep the color and black white image names identical in each folder. That way, we create one book file and depending on which folder we point to for image links, the output is either in black and white (print) or in color (e-book). No doubt there are other ways of swapping in images and working in InDesign to achieve the same end, but this seemed simplest to us at the time, and it worked very well. We're going to do the same thing this summer for the new edition of the China travel book. This was in the end a project that was more complicated and costly for all concerned. Linda Ronan and Alex De Vera in our office spent many, many hours working on layout and checking details, sometimes multiple times. Judith has already described her efforts. When the book came out we donated two cases of books to Kyoto Center for Community Collaboration helping to restore machiya, which was part of our promise to Judith when we first took on the book. From the sale of these books they will gain over $1,000 in revenue. I'm glad to see our book have that kind of impact in the real world. I hope it will also lead many visitors to some tasty meals and stunning interiors. 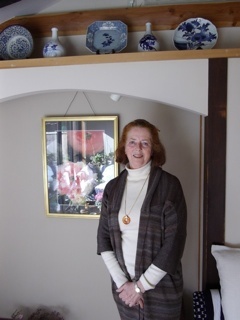 Judith Clancy is a brilliant writer and the Kyoto authority, so I was happy to sign on to produce new photographs for her Kyoto Machiya Restaurant Guide. The book-in-progress was an undertaking that I knew Judith had nurtured tirelessly and one that she was determined to finally complete. Collaborating with her, I learned a great deal more about a city I’ve been photographing for many years. For one thing, I had never stepped inside a machiya restaurant until beginning this project, and (another true confession) I had never ridden a bicycle in Kyoto before. 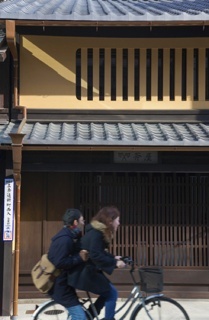 Judith’s trusty bicycle is an important part of her daily Kyoto routines, and she quickly had me following suit. Locating a sturdy rental bike with a front basket large enough for my camera bag, I bought a ¥100 bungee cord to strap my tripod on the back carrier, and off we went. Judith set a tireless schedule, but I savored our long working days, visiting as many machiya restaurants as we could possibly fit in. I saw the city from a fresh perspective offered by the bicycle’s variable pace and mobility. Any time not spent specifically photographing at Judith’s recommended restaurants I used for cruising the essentially flat streets and alleys of central Kyoto, where the bulk of the city’s machiya are found—perfect territory to wander around by bike. 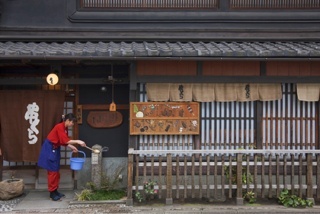 Despite having done much previous work in Kyoto involving traditional architecture, with Judith focusing my vision, I learned something new every day regarding the unique aspects of Kyoto’s machiya. It was like a treasure hunt—the Shōki-san demon-queller figures standing guard above traditional exterior eaves, the ingenious battari-shōgi folding wooden benches, kumo-gata cloud-shaped windows, naka-no-niwa interior gardens open to the sky—uncovering new meaning and discovering architectural details in streets and structures I had seen before, but was encountering again with freshly informed eyes. I approached each machiya restaurant with the goal of using the available natural and ambient light in hopes of capturing the interior atmosphere as well as illuminate the architectural elements. The actual photography work was relatively easy, because Judith had inevitably pre-charmed the relevant restaurant staff, minimizing the troublesome process of aisatsu greeting formalities when seeking the necessary permissions for shooting. 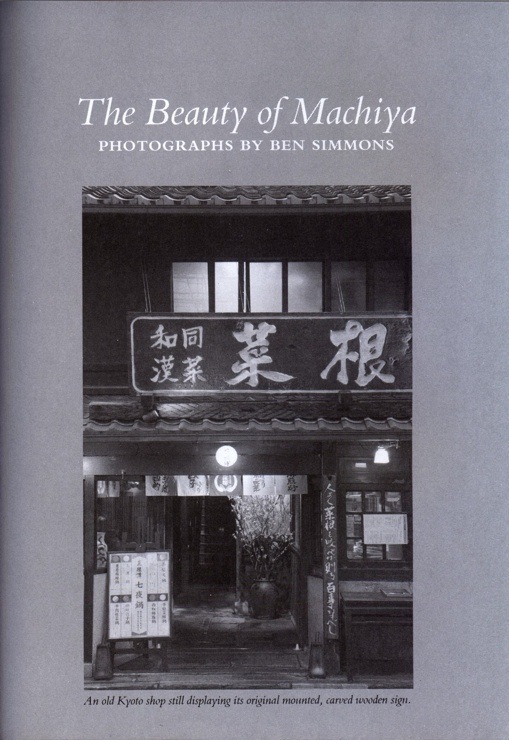 Judith and I both wanted to use the resulting machiya photographs in color for the book, but I was impressed by the fine job Peter Goodman and his publishing team did with the black-and-white “Beauty of Machiya” portfolio. 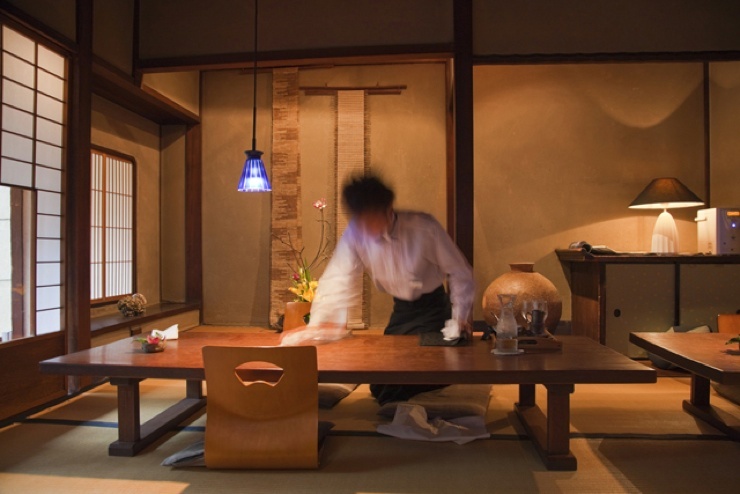 All things considered—space, budget, layout—I think it works extremely well in capturing the feeling and form of the machiya and their interior spaces. The beauty and function of Judith’s Kyoto Machiya Restaurant Guide is in the invitation it proffers and the access it provides to a most impressive and previously undiscovered network of Kyoto’s unique machiya eateries. These restaurants are hidden gems—casual visitors and even old hands hesitate to enter (or completely overlook) the subtle front entrances of most machiya, fearing what expensive and exclusive fare might await them within. It was always a wonderful surprise to explore the finely built machiya with their delightful interior gardens, unexpectedly reasonable prices, and delicious meals. 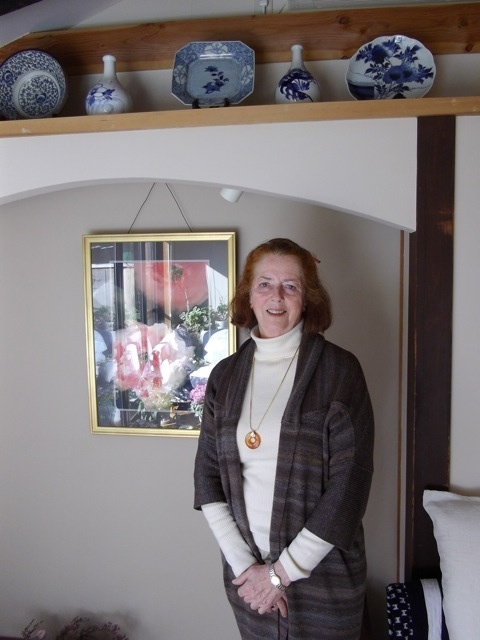 I am thankful to Judith for letting me make a contribution to her labor of love for Kyoto’s invaluable machiya heritage. 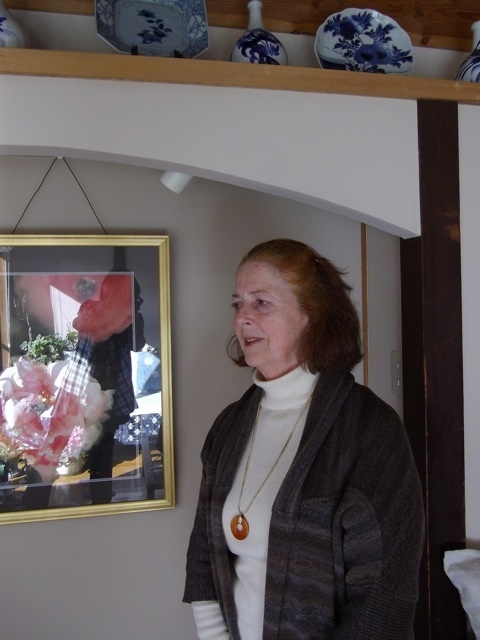 Judith Clancy was interviewed in the revived PingMag on May 29, 2013. Both an English interview and one in Japanese, with photos, are in the Architecture section. PingMag, an online zine showcasing Design and Making Things, ceased publication at the end of 2008 and re-started in March 2013 after a 5-year hiatus.